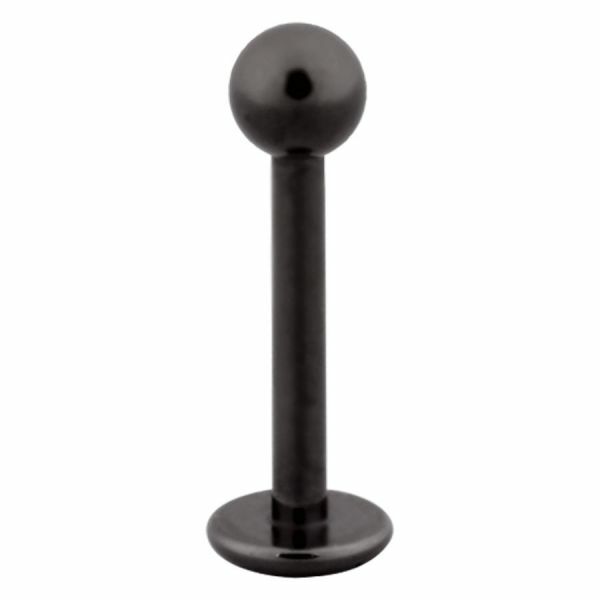 The Titan Blackline® Micro Labret Stud has a strength of 1.2 mm and is available in lengths of 5.0 – 10.0 mm (in steps of one). The suitable ball has a diameter of 3.0 mm. The bottom part of the attire is flattened, the top part gets closed by a threaded ball (so a labret / stud consists of a bar with a small plate and a ball). The ball gets screwed onto the studs external thread. By the way, all threads in our jewellery collection are standardised, therefore you can combine the rings, balls, bars and attachments. Keep an eye on sizes and threads of your favoured balls and attachments! This article is also available in the Titan Zirconline® (GZL) and the Titan Highline® (ZLS). If you are looking for an alternative to titan and steel, we suggest our BioPlast line (e.g. WAB/BLA). The suitable replacement balls can be found in the Titan Zirconline®, they are called KTB.